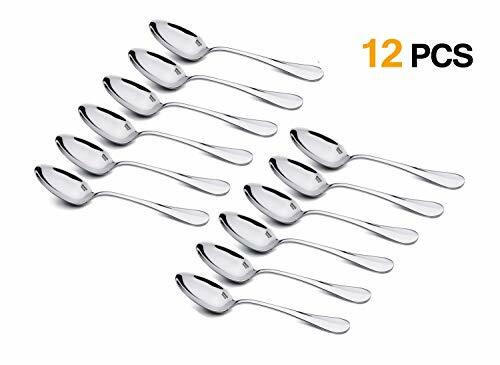 Material:Set of 12 coffe spoons,Crafted of high quality stainless steel,Add contemporary style to your table. Polished Craft:Mirror finished surface, smooth edge no rough spots, proper gauge thickness and weight to hold comfortably. Classic Design:The coffee spoon is small and exquisite, the handle is round and well gripped, and the size matches the coffee cup well. Occasion:The small spoons are perfect for tea,coffee,cappuccinos,espressos,dessert,appetizers. Great for sugar, cream and stirring.It can work as a baby spoon as well. Easy to Clean:Sturdy rust-resistant construction,hold up to frequent washings,while retaining their smooth finish and luster. If you have any questions about this product by OTW PAVILION, contact us by completing and submitting the form below. If you are looking for a specif part number, please include it with your message.